Neither Mumbai’s human congestion nor vehicular gridlock hinders the dedicated guys – the dabbawallahs – who transport thousands of wives’ lovingly cooked hot lunches to their office-worker husbands. These delivery mens’ blemish-free accuracy – documented by a Harvard study! – is jaw-dropping, considering the volume of goods shuttled back and forth. Until one day, there’s a destination error which, in the hands of writer and director Ritesh Batra, becomes the core of his delish new movie The Lunchbox. 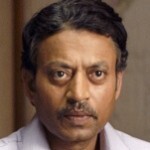 Saajan Fernandes (Irrfan Khan) is a sad-eyed, solitudinal widower who’s been a numbers juggler for more than three decades in a civil claims department. He’s about to retire in the traditional way – heading off to a rural area to enjoy some well earned peace and quiet – as soon as he trains Shaikh (Nawazuddin Siddiqui), an impish, ill-trained and less-than-committed successor. As far as lunches go, Saajan gets his non-descript eats from a run-of-the-mill food service. His life these days is as flavorless as his perfunctory food fare. In another part of the city, Ila (Nimrat Kaur) knows that her husband’s (Nakul Vaid) romantic interest in her has waned. Her strategy to win him back – she enlists the help of her loud, off-screen upstairs neighbor who advises on spice content – is to use lunch food as enticement. Ila’s meal is saliva-inducing on the screen and doled out into separate metal containers, along with a note to her wayward spouse. Her tasty parcel, loaded onto a truck for delivery, is the seemingly sole item that wrecks the dabbawallahs’ superb track record by getting routed to the wrong recipient, Saajan. Soon these two injured souls come alive and the movie takes a living-for-the-lunch-hour turn. Saajan marvels at the sudden reintroduction of delectability into his life via Ila’s delicious sustenance, and both parties start passing increasingly heartfelt notes to each other within the food receptacles about their lives and hopes. At this point, the audience begins getting hungry for something else: a happy-forever-after ending for this duo. Batra contrasts an often soulless Saturnine tradition borne of responsibility – such as Ila’s loveless marriage and Saajan’s living in the past while enduring a job for security – with Uranian surprises and risks, exemplified by the accidently delivered lunch and an embrace of the future that both Ila and Saajan can metaphorically taste. To those obsessed with caution and standardization, an Uranian occurrence can easily be interpreted as nothing more than a fixable accident or detour. For the more self-aware, accidents can become the solution to be embraced and celebrated.